Learn how to make deviled eggs with this classic deviled egg recipe that is always a crowd fave. Options below for how to make yours with either mayo or Greek yogurt, plus lots of ideas for fun add-ins! You knew where yesterday’s post about hard-boiled eggs was headed. For years and years, I’ve been meaning to post an easy deviled egg recipe here on the blog. And for years and years, I’ve always accidentally (whoops) spaced it off. 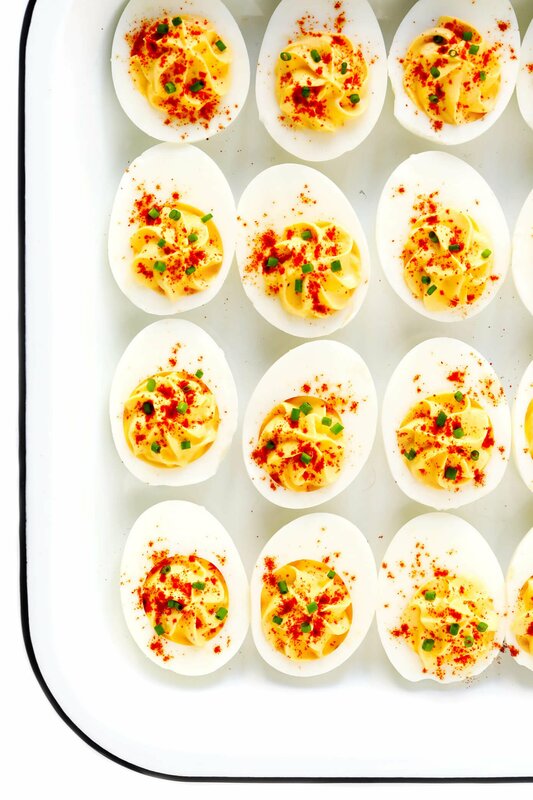 But with Easter just around the corner, I figured that today was the perfect time to share my back pocket, tried-and-true, classic-with-a-few-modern-tweaks, always-always-always-a-crowd favorite recipe with you for the best deviled eggs! They’re super easy to make (plus I’ve also included tips for how to prep them days ahead of time, if you would like). They can be made with traditional mayo if you prefer, or you can lighten them up by swapping in Greek yogurt if you’re not a mayo fan like me. I also love to make mine with a squeeze of fresh lemon juice instead of vinegar, which helps to brighten them up a bit. But more than anything, I just love this deviled eggs recipe because these little guys are irresistibly good. They always disappear instantly when I serve them up for Easter dinner or a springtime brunch, and people always ask what’s in them that makes them so light and flavorful. So today, I’m happy to finally be sharing all of my best tips and secrets for how to make the best deviled eggs. Let’s get to it!